What are the consequences of PI3K pathway mutations for mammary tumorigenesis? The protein serine/threonine kinase Akt, also known as protein kinase B (PKB), is arguably the most important signalling nexus in the cell. 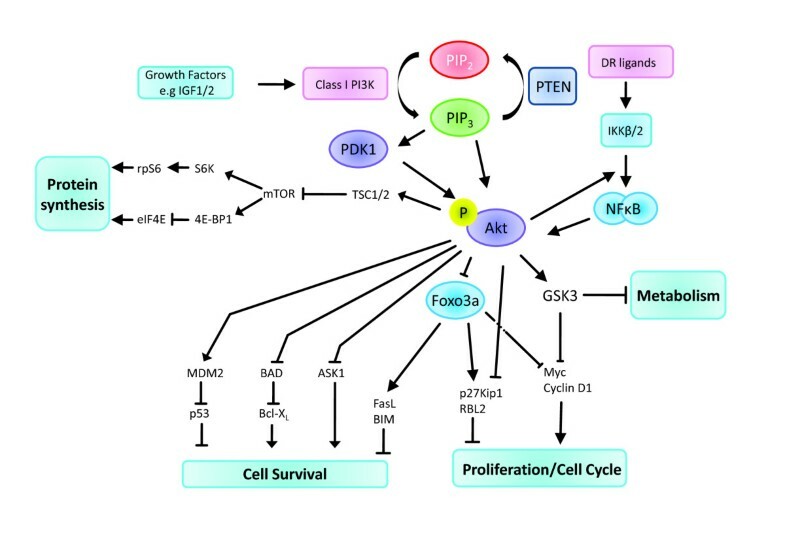 Akt integrates a plethora of extracellular signals to generate diverse outcomes, including proliferation, motility, growth, glucose homeostasis, survival, and cell death. The phosphatidylinositol 3-kinase (PI3K)/Akt pathway is the second most frequently mutated pathway in cancer, after p53, and mutations in components of this pathway are found in around 70% of breast cancers. Thus, understanding how Akt relays input signals to downstream effectors is critically important for the design of therapeutic strategies to combat breast cancer. 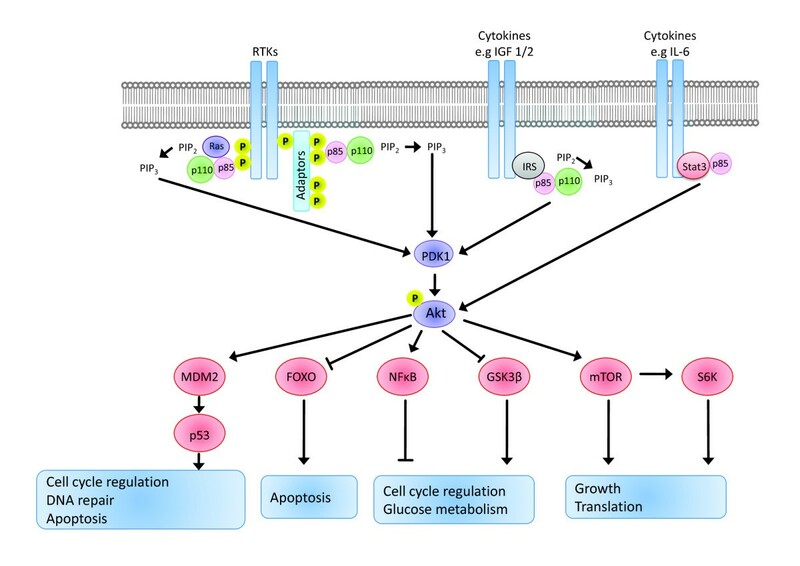 In this review, we will discuss the various signals upstream of Akt that impact on its activity, how Akt integrates these signals and modulates the activity of downstream targets to control mammary gland development, and how mutations in components of the pathway result in breast cancer. There are three principal components of the Akt pathway: phosphatidylinositol 3-kinase (PI3K), its antagonist PTEN (phosphatase and tensin homologue deleted on chromosome ten), and the serine/threonine kinase Akt, which is expressed as three different isoforms, Akt1, Akt2, and Akt3, which are structurally similar but transcribed from different genes . These isoforms have distinct expression patterns and functions. Downstream substrates of activated Akt include the serine/threonine kinase mammalian target of rapamycin (mTOR) and the Forkhead family of transcription factors (FOXO). The kinase activity of Akt is dependent upon phosphorylation of threonine 308 and serine 473. This is most often mediated by class IA PI3K, a member of the family of intracellular lipid kinases that are activated by growth factor RTKs (receptor tyrosine kinases) such as insulin receptor, insulin-like growth factor receptor (IGF-1R), platelet-derived growth factor receptor (PDGFR), and members of the epidermal growth factor (EGF)/ErbB family in addition to G protein-coupled receptors and oncogenes such as Ras. Other classes of PI3K do not activate Akt and will not be discussed further. At the plasma membrane, PI3K phosphorylates the 3'-hydroxyl group of phosphatidylinositol 4,5 diphosphate (PIP2) to generate phosphatidylinositol-3,4,5-trisphosphate (PIP3), a lipid second messenger that binds to the pleckstrinhomology (PH) domains of down stream target molecules such as 3-phosphoinositide-dependent kinase 1 (PDK1) and Akt. This results in autophosphorylation of PDK1 at Ser241 within its activation loop, resulting in the transphosphorylation of Akt (Figure 1) in addition to other serine/threonine kinases, including PKC, ribosomal p90 S6 kinase (S6K), and SGK. The Rac/Cdc42 kinase, PAK1, and the Rho kinase, PKN/PKC-related kinase 1, which are associated with invasion and metastasis, are also activated by PDK1. Signalling from receptor tyrosine kinases to Akt is mediated by PI3kinase regulatory subunits and adaptor molecules that activate PI3K, which in turn converts PIP 2 to PIP 3 . FOXO, Forkhead family of transcription factors; GSK3, glycogen synthase kinase 3; IGF 1/2, insulin-like growth factor 1/2; IL-6, interleukin-6; IRS, insulin receptor substrate; mTOR, mammalian target of rapamycin; NF-κB, nuclear factor-kappa-B; P, phosphate; PDK1, 3-phosphoinositide-dependent kinase 1; PI3K, phosphatidylinositol 3-kinase; PIP2, phosphatidylinositol 4,5 diphosphate; PIP3, phosphatidylinositol-3,4,5-trisphosphate; RTK, receptor tyrosine kinase; S6K, S6 kinase. In addition to PDK1-mediated Thr308 phosphorylation, phosphorylation on Ser 473 by the mTOR-rictor kinase complex is required for full activation of Akt, which leads, in turn, to phospshorylation of Akt targets such as the FOXO family of transcription factors. FOXO proteins are inactivated by Akt phosphorylation, resulting in their binding to, and sequestration in the cytoplasm by, 14-3-3 proteins. FOXO target genes include the pro-apoptotic BH3-only protein Bim and the DR (death receptor) ligand FasL . Of the three classes of PI3Ks, class IA and its components are most frequently the target of mutations in cancer. Indeed, this pathway is unusual in that all of its major components are either mutated or amplified in a wide range of cancers. Class IA PI3Ks are obligate heterodimers of a p85 regulatory subunit and a p110 catalytic subunit. In the mouse, there are three catalytic subunits (p110α, β, and γ) and five regulatory subunits (p85α, p55α, p50α, p85β, and p55γ), whereas in Drosophila melanogaster, there is one catalytic and one regulatory subunit . The regulatory subunits recruit the catalytic subunits to phosphotyrosine (pY) residues in either the cytoplasmic tail of the receptor or receptor-bound adaptors and signalling molecules such as Stat3 . The three α regulatory subunits are encoded by the same gene (pik3r1) but transcribed from different promoters, at least in mammary gland. The regulatory subunits stabilize, but inhibit, the catalytic subunits unless bound to pY motifs. PTEN, as its name suggests, is a phosphatase that reverses the action of PI3K by dephosphorylating PIP3, thereby regulating Akt activity and downstream responses . PTEN has phosphatase, C2, and PDZ-binding domains and has recently been shown to shuttle between the nucleus and cytoplasm in response to its phosphorylation status, which may contribute to its ability to modulate cell growth and viability. Several kinases have been reported to phosphorylate PTEN . Recently, the Fyn-related kinase FRK, a member of a small family of intracellular Src-related tyrosine kinases, has been shown to phosphorylate PTEN, suppressing its association with the E3 ubiquitin ligase NEDD4-1, thereby reducing polyubiquitination and proteosomal degradation of PTEN . One of the most important functions of Akt is in the regulation of glucose homeostasis and metabolism, particularly in muscle and fat. Uptake of glucose via the glucose transporter GLUT4 is facilitated by translocation of GLUT4 to the plasma membrane in response to Akt. Akt also inhibits GSK3 (glycogen synthase kinase 3), thereby activating glycogen synthase, and activates ATP citrate lyase, thereby regulating fatty acid synthesis. Given the importance of adipose tissue and its remodelling during a pregnancy/lactation/involution cycle, it would be anticipated that Akt would have a critical role to play in mammary gland. Indeed, this has been found to be the case, as discussed below. Akt regulates transition through the cell cycle by inhibiting the transcriptional activity of FOXO, which has a number of cell cycle regulatory proteins as its targets. These include the cell cycle inhibitor p27 and RBL2 (retinoblastoma-like 2). Akt is a survival factor, regulating the expression of FasL and Bim via FOXO. In addition, Akt directly phosphorylates the pro-apoptotic protein Bcl2 antagonist of cell death (BAD), causing its inactivation by binding to 14-3-3 protein, and phosphorylates the p53 regulator MDM2, leading to p53 degradation. Furthermore, the nuclear factor-kappa-B (NF-κB) family of transcription factors can be activated downstream of PI3K by a mechanism that requires association of the regulatory p85α subunit through its SH2 domain with inhibitor of kappa-B alpha (IκBα) . Additional pathways activate NF-κB via Akt association with inhibitor of kappa-B kinase (IKK), resulting in IKK activation and phosphorylation of IκB . NF-κB regulates a wide range of cellular responses, including growth and survival, and is a critical regulator of inflammatory signalling. More recently, it has been shown that Akt-dependent regulation of NF-κB requires mTOR and Raptor . Akt regulates protein synthesis by phosphorylating the tuberous sclerosis complex 2 (TSC2) protein tuberin, thus inhibiting the GAP (GTPase-activating protein) activity of the TSC1-TSC2 complex toward Rheb (small G protein Ras homologue enriched in brain). GTP-bound Rheb accumulates and activates the mTOR-Raptor kinase complex, which in turn mediates phosphorylation of 4E-BP1 (eukaryotic translation initiation factor 4E-binding protein 1) and p70S6Kinase, ultimately leading to increased protein synthesis . Finally, PI3K regulates cell polarity and motility in concert with the small GTPases Rac, Rho, and Cdc42 by controlling actin dynamics in motile cells . All four catalytic subunits of PI3K are implicated in cell migration, and p110α has been associated with increased invasiveness in a variety of tumors. These functions of PI3K/Akt are illustrated in Figure 2. Signals feeding into Akt and their relay to downstream target molecules and cellular processes. DR, death receptor; FOXO, Forkhead family of transcription factors; GSK3, glycogen synthase kinase 3; IGF 1/2, insulin-like growth factor 1/2; IKKβ/2, inhibitor of kappa-B kinase β/2; mTOR, mammalian target of rapamycin; NF-κB, nuclear factor-kappa-B; P, phosphate; PDK1, 3-phosphoinositide-dependent kinase 1; PI3K, phosphatidylinositol 3-kinase; PIP2, phosphatidylinositol 4,5 diphosphate; PIP3, phosphatidylinositol-3,4,5-trisphosphate; PTEN, phosphatase and tensin homologue deleted on chromosome ten; S6K, S6 kinase; TSC1/2, tuberous sclerosis complex 1/2. As mentioned above, it can be anticipated that the PI3K/Akt pathway would have important functions in mammary gland development and function. The generation of genetically altered mice either deficient for, or expressing constitutively active forms of, specific pathway components has revealed their function in the context of mammary gland development. The three Akt isoforms are perhaps the most studied components of the pathway. Akt1 is required for efficient lactation to support offspring, and deletion of Akt1 results in a failure to localize Glut1 at the plasma membrane, reducing glucose uptake. In addition, upregulation of lipid synthesis and lipogenic enzymes and downregulation of lipid catabolic enzymes do not occur in Akt1 knockout mice . Expression of a constitutively active Akt1 that mimics the active phosphorylated state of the protein results in a delayed post-lactational regression (involution) . A later study showed that expressing a membrane-targeted form of Akt1 (myr-Akt) under the control of the mouse mammary tumor virus (MMTV) promoter resulted in a lactation defect in addition to delayed involution. Precocious accumulation of cytoplasmic lipid droplets occurred in the alveolar epithelium of MMTV-myr-Akt transgenic mice during pregnancy and this resulted in stunted growth of the pups, which were 50% smaller during the first 9 days of lactation. Since the fat content of milk from the lactating transgenic dams was more than double that of non-transgenic controls, it has been suggested that this high-viscosity milk reduced suckling by the pups . A striking delay in involution was observed also in two independent studies of Akt1 overexpression in mammary gland. The reduced cell death was associated with prolonged expression of TIMP-1 (tissue inhibitor of metalloproteinase-1) and increased phosphorylation of Thr308 in Akt1 and Ser136 in BAD [15, 16]. Notably, overexpression of Akt1 alone is insufficient to induce transformation, although expression of activated Akt does accelerate tumor development . Akt1 and Akt2 appear to have opposing functions in mammary gland since ablation of Akt1 delayed development and differentiation during pregnancy and lactation whereas Akt2 deficiency resulted in precocious differentiation. Likewise, although involution is accelerated in the absence of Akt1, it is delayed in Akt2-deficient mammary glands. Akt3 seems to have a minor role . In another study, transgenic mice expressing an activated Atk2 (Akt2-DD) in the mammary epithelium showed that activated Akt2 expression delayed mammary gland involution , as was seen for activated Akt1. This discrepancy could be related to a requirement for Akt2 in non-epithelial cells as transplantation experiments showed this effect to be non-epithelial cell-autonomous. This is not surprising given the role of insulin signalling in adipose tissue. Indeed, both Akt1 and Akt2 have important roles in adipocyte differentiation as demonstrated by studies in double-knockout mice . Whether this is true also for adipocytes in the mammary fat pad remains to be determined. Preliminary studies from our laboratory indicate that Akt2 is expressed predominantly in adipocytes, and not the epithelium, during involution. Akt1 and Akt2 have different effects also on cell migration. Activation of Akt1 prevents an epithelial-to-mesenchymal transition (EMT), an event required for metastasis, and decreases motility and invasion of breast cancer cell lines via degradation of the NFAT (nuclear factor of activated T cells) transcription factor . This result is supported by experiments using siRNA (short interfering RNA)-mediated knockdown of Akt1, but not Akt2, in the non-transformed breast epithelial cell line MCF-10A in three-dimensional (3D) matrigel cultures . Hyperstimulation of IGF-1R resulted in 3D acini that had filled, rather than hollow, lumens. Lumen filling was reverted by Akt2 downregulation that blocked hyperproliferation and the antiapoptotic activities of IGF-1R overstimulation, while reduction of Akt1 enhanced cell migration and produced an EMT-like morphological change . These differing roles are observed also in studies in mouse tumor models, as discussed below. Interestingly, deletion of Akt1, but not Akt2 or Akt3, interferes with the phosphorylation of Stat5a during late pregnancy and lactation. Although overexpression and hyperactivation studies need to be interpreted with caution, it is clear that the three isoforms of Akt have different roles in mammary gland development. Further work is needed to determine the cell-type specificity of Akt isoform function in mammary gland. The three catalytic subunits p110α, p110β, and p110δ are all expressed throughout a mammary developmental cycle . Transgenic mice in which a myristoylated p110α protein was expressed under the control of the MMTV promoter exhibited delayed mammary gland involution and changes in ductal morphology in young mice . The role of the other catalytic subunits has not been directly addressed as loss of p110α and p110β results in embryonic lethality, precluding analysis of their roles in mammary gland . The two small regulatory subunits p55α and p50α have an unexpected function in involuting mammary gland . The expression of these subunits is dramatically upregulated by Stat3 during involution and this is associated with a decrease in the levels of pAkt. Overexpression of individual isoforms in mammary epithelial cells resulted in elevated apoptosis, suggesting that Stat3 induces cell death, in part, through upregulating the levels of the p55α/p50α subunits to reduce pAktmediated survival signalling by competition with p85α for the catalytic subunits . Overexpression of PTEN, as the predominant negative regulator of PI3K, would be expected to promote apoptosis and involution and possibly also to affect differentiation during pregnancy. This was investigated using a transgenic mouse model in which human PTEN overexpression was driven by the MMTV promoter (MK-PTEN) in ductal and alveolar mammary epithelium during a pregnancy cycle. Lactation was abnormal in MK-PTEN females, with about one third of the pups dying and the survivors displaying growth retardation . This was the consequence of reduced differentiation of the alveoli and suppressed milk protein gene expression and was associated with a decrease in the levels of pAkt. The reciprocal experiment was carried out by conditional deletion of PTEN in mammary epithelium and resulted, not surprisingly, in a reciprocal phenotype. In addition to excessive ductal branching, precocious lobuloalveolar development during pregnancy and delayed involution, coupled with reduced apoptosis, were observed . Importantly, PTEN-null mammary epithelial cells were hyperproliferative, resulting in the early development of mammary tumors. A role for PTEN in tissue architecture was elegantly demonstrated using 3D acinar cultures of mammary epithelial cells. PTEN was shown to co-localize at cell-cell contacts with the E-cadherin/beta-catenin complex. Reduction of PTEN levels by shRNA (short hairpin RNA) in laminin-rich extracellular matrix cultures prevented formation of properly organized acini, and conversely, blocking cell-cell contact using E-cadherin function blocking antibodies reduced the levels of endogenous PTEN, suggesting a role for PTEN in cell adhesion . IGF ligands regulate ductal outgrowth and branching during puberty and are required also for alveolar development during pregnancy . The IGF-1R is essential for proliferation in TEBs (terminal end buds) during puberty, while overexpression disrupts development and can lead to tumorigenesis . The role of insulin in mammary gland development is less well understood. Insulin receptor-A binds IGF-II in addition to insulin but does not bind IGF-I. However, IGF-II stimulates the PI3K pathway more efficiently than insulin and appears therefore to be the most important mediator of IGF signalling . Interestingly, either injection of IGF-II into mouse mammary glands or overexpression in a transgenic model resulted in increased expression of PTEN and concomitant downregulation of pAkt levels. As mentioned above, Akt has a considerable number of downstream targets that control different cellular processes. It is not clear how these are integrated at the Akt hub to dictate the outcome, although the role of individual targets has been extensively investigated. There are a limited number of studies on specific roles in mammary gland, although given the changes in pAkt levels at the lactation/involution switch and the proliferation/differentiation switch in pregnancy, it is likely that many of these targets are important. A diagrammatic summary of the signals leading into and emanating from Akt is shown in Figure 2. An extensive discussion of each of these targets is beyond the scope of this review but is reviewed elsewhere . It is worth noting that cyclin D1 and NF-κB have both been shown to be important in the development of the mammary gland during pregnancy [31, 32]. Given the importance of the PI3K/Akt pathway in regulating proliferation, differentiation, and apoptosis of mammary epithelial cells, inappropriate activation of this pathway by genetic mutation or amplification of key signalling components could be anticipated to result in tumorigenesis. Furthermore, the most effective type of therapy for breast cancer is likely to depend on the mode of activation and the function of the particular pathway component that is aberrantly activated. Most studies fall into two categories: modification of PI3K signalling in mouse mammary tumor models or determination of the activity of pathway components in breast cancer tissue samples. The most informative mouse modelling studies are discussed first. Notably, overexpression of Akt1 alone is not sufficient to induce tumorigenesis  and cooperating oncogenes are required to elicit tumorigenic effects. Studies in transgenic mice suggest that Akt1 and Akt2 have distinct roles in mammary tumor induction in two commonly used tumor models, activated ErbB2 (NDL) and polyoma virus middle T antigen (PyVmT). In NDL/activated Akt1 crosses, tumorigenesis is accelerated but the tumors have a more differentiated phenotype and invasion is suppressed . This corresponds to a reduction in the number of metastatic lesions compared with NDL strain alone. In both of these tumor models, deletion of Akt1 resulted in a dramatic defect in tumor induction, while in contrast, tumorigenesis was accelerated in Akt2-deficient mice. Overexpression of constitutively active Akt1 in PyVmT/PI3K-independent transgenics decreased tumor latency and this was observed also for NDL transgenics. Overexpression of constitutively active Akt2 in the same two tumor models did not affect tumor latency but did, however, increase lung metastasis. Thus, as seen for normal mammary gland development, Akt1 and Akt2 have different roles in mammary tumorigenesis and metastasis . A further insight into mechanisms by which the balance of Akt1 and Akt2 controls metastasis was revealed by microRNA profiling of cells triple-null for Akt1/2/3 that were transfected with individual Akt isoforms. Expression of the miR-200 family was decreased in cells expressing Akt2 or with knockdown of Akt1 expression, the latter associated with an EMT . This led the authors to suggest that EMT is controlled by the abundance of miR-200 microRNAs that are regulated by the relative amounts of Akt1 and Akt2. In another study, MMTV-myr-Akt1 transgenic mice were crossed with MMTV-c-ErbB2 transgenic mice and a similar acceleration in tumor development was observed. The presence of activated Akt1 did, however, have an influence on the expression and activation of EGF receptor (EGFR) family members. The MMTV-c-ErbB2 tumors overexpressed EGFR, ErbB2, ErbB3, and ErbB4 and exhibited phosphorylation of both ErbB2 and ErbB3, whereas tumors from the bitransgenic mice had dramatically less overexpression and phosphorylation of ErbB3, diminished phosphorylation of ErbB2, a decreased level of EGFR protein, and undetectable ErbB4 protein . This result suggests that ErbB2-targeted therapies would be less effective when an additional mutation/activation of Akt1 is also present in the tumor. PI3K can be activated when p110α is forced to localize at the plasma membrane by myristoylation. Transgenic mice expressing myrp110α had increased ductal branching, alveolar hyperplasia, and intraductal neoplasia, which occasionally resulted in mammary tumors. It is worth noting that the tumors that arose in myrp110α transgenic mice had increased phosphorylation of estrogen receptor α, a feature of breast cancer . PTEN mutations are uncommon in breast cancer, affecting only about 5% of patients. Reduced expression of PTEN at the protein level is much more common and occurs in 30% to 50% of patients, generally correlating with a less favorable outcome. Consistent with its function as a tumor suppressor, loss of heterozygosity (LOH) of Pten is frequent and loss of both alleles is a feature of metastatic disease. Low expression of PTEN also correlates with unresponsiveness to breast cancer therapies such as trastuzumab (Herceptin), tamoxifen, and gefitinib. In mice, mutations in Pten do not usually lead to mammary carcinoma. However, crosses of PTEN heterozygous mice to MMTV-Wnt-1 transgenic mice accelerated the onset of ductal carcinomas compared with control MMTV-Wnt-1 transgenic mice and this was associated with elevated levels of pAkt . Furthermore, the majority of the tumors lost the remaining Pten allele, indicating a growth advantage for the PTEN-null tumor cells. Co-operation between PTEN and ErbB2 was investigated by crossing transgenic mice harboring a Cre-inducible activated erbB-2 under the control of the endogenous erbB-2 promoter (ErbB-2KI) to mice with floxed PTEN alleles and MMTV-driven Cre recombinase . Deletion of a single allele of Pten not only accelerated ErbB-2-induced mammary tumor progression but increased lung metastases. Interestingly, PTEN-deficient/ErbB-2KI mammary tumors were heterogeneous, with some cells having characteristics of basal cells such as SMA expression. PTEN deficiency also promoted ErbB2- mediated tumorigenesis in a mouse model using the MMTV promoter to drive expression of activated ErbB-2 and Cre recombinase in the same cells. Multifocal, highly metastatic tumors were formed in concert with increased pAkt and angiogenesis . Interestingly, in this scenario, the tumors displayed molecular and histopathological features of the luminal subtype. Recently, it has been demonstrated that loss of PTEN in stromal fibroblasts accelerates the initiation, progression, and transformation of mammary epithelial tumors . PDK1 has been shown to be oncogenic in Comma-1D mouse mammary epithelial cells, and Pten+/- tumor  formation was severely attenuated when bred with Pdpk1 hypomorphic mice that had only 10% of normal PDK1 enzyme activity. A non-catalytic role for PDK1 in cancer cell motility involves direct binding to ROCK1 and localization at the plasma membrane, where it is required to drive cortical acto-myosin contraction and cell motility . Several studies have demonstrated that rapamycin, which inhibits mTOR, a downstream target of Akt, sensitizes certain resistant cancer cells to chemotherapeutic agents. The efficacy of mTOR inhibition was analyzed in MCF-7 breast cancer cells, expressing a constitutively active Akt, that are resistant to the growth inhibitory effects of tamoxifen. It was found that treatment with rapamycin restored sensitivity to tamoxifen and blocked estrogen receptor-α-mediated transcriptional activity . A variety of different types of mutations, including gene amplification, mutation, and LOH, have been found in breast tumors in different components of the PI3K/Akt pathway. Epigenetic changes that reduce expression are also likely but are not usually detected in mutation analyses. The types of mutations and their frequencies are listed in Table 1. Mutations in p110α occur in around 35% of breast tumors. One study revealed more than 20 different mutations, at different frequencies, in p110α (encoded by the PI3KCA gene) in breast cancers. The biological effect of individual mutations was assessed by using lentivirus to express 10 of these mutant PIK3CA genes in the human breast epithelial cell line MCF10A. Expression of most of the mutations resulted in morphological changes in MCF10A cells in 3D acinar culture, differentially promoted cell invasion, and activated p-AKT and p70-S6K in the absence of EGF stimulation . Another frequently mutated gene is PDPK1, usually resulting in overexpression as a result of gene amplification. Approximately 1 in 5 breast tumors have at least 5 copies of the PDK1 gene, PDPK1, and the increased copy number is associated with additional upstream mutations such as ErbB2 amplification, PTEN loss, or PI3K mutation. In orthotopic transplantation models, overexpression of PDK1, though not oncogenic by itself, dramatically enhanced ErbB2-mediated tumorigenesis . Two previous reports, using immunohistochemistry analysis, suggested increased phosphorylated PDK1 protein levels in the majority of human breast cancers. Thus, alterations in the levels of PDK1 protein seem to be an important factor in breast cancer. Although mutations in PTEN are rare, LOH is a common feature of breast cancers, being observed in approximately 25% of tumors. Mutations in Akt1 and amplification of Akt2 are infrequent, although a specific mutation in the PH domain of Akt1 that results in a glutamic acid-to-lysine substitution in its lipid-binding pocket has been found in breast, colorectal, and ovarian cancers . Cytoplasmic localization of FOXO3a is associated with a poor survival rate in breast cancer patients and has been shown to be correlated with expression of IKKβ or pAkt. Interestingly, IKKβ-mediated tumorigenesis can be suppressed by FOXO3a . Although the PI3K inhibitors wortmannin and LY294002 can inhibit tumor growth, they have high toxicity, thus limiting their clinical usefulness. A more potent and less toxic derivative of wortmannin, PX-866, has been tested and shown to be effective in xenograft studies, but the lack of specificity of these inhibitors is likely to render them unsuitable for therapy. Reconstitution or overexpression of PTEN activity could be an approach to counteracting PI3K activity and has been shown to reduce Wnt-induced mammary hyperplasia. Adenoviral delivery of PTEN is a potential option in the clinic and can induce apoptosis in xenografts of colon carcinoma cells . Rapamycin analogues are currently in clinical trials. These might be effective in treating cancers with p110α or PTEN mutations since Akt is already active, but are less likely to be effective in cancers in which PI3K activation is negatively regulated by mTOR. Inhibition of mTOR has been shown to restore the response to tamoxifen in breast cancer cells that have aberrantly activated Akt . A potential problem with inhibiting p110α, since it is a key mediator of insulin signalling, could be type II diabetes. Another possibility is isoform specific inhibition of Akt. Combination therapy with EGFR or ErbB2 inhibitors could lead to side effects that are less toxic. Therapeutic drugs currently in use or in clinical trial against different components of the PI3K pathway are shown in Figure 3. Therapeutic drugs that target various components of the phosphatidylinositol 3-kinase (PI3K)/Akt pathway. EGFR, epidermal growth factor receptor; HER2, human epidermal growth factor receptor 2; mTOR, mammalian target of rapamycin; VEGFR, vascular endothelial growth factor receptor. 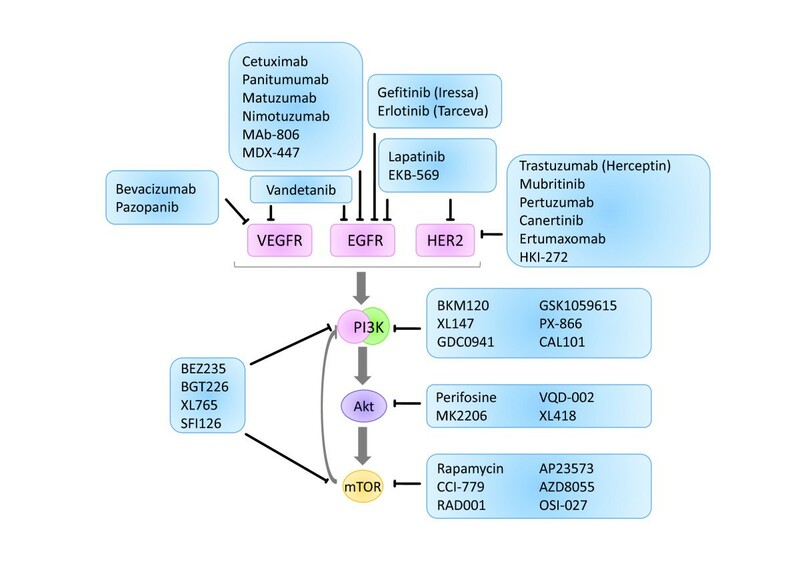 The PI3K/Akt pathway is frequently dysregulated in breast cancer as a result of mutation, amplification, or deletion of different components of the pathway. Although a number of drugs are available, the essential function of Akt as the intracellular hub that integrates signals from growth factors to control metabolism, protein synthesis, growth, and cell survival-death decisions presents unique challenges for the design of drugs with few off-target effects. This article is part of a review series on key signalling nodes in mammary gland development and cancer, edited by Adrian Lee and Charles Streuli. Other articles in the series can be found online at http://breast-cancer-research.com/series/signalling_nodes.